TO SEE JOVANNA'S CURRENT PROJECTS AND WORK IN PROGRESS, CLICK HEAR! Jovanna prints every illustration by herself (on demand), so there is love behind each print. The paper is a beautiful high quality Fine Art paper, a fourdrinier, acid-free, museum quality paper with a natural white finish and rough ‘watercolour’ textured surface, 315g. All prints are signed by Jovanna. Jovanna Radic Eriksson from Gothenburg, Sweden, is an Illustrator and Communicator, producing content for digital platforms. 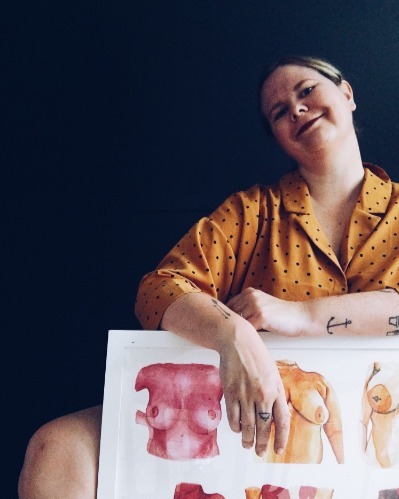 She is illustrating for a body positive and feminist present and future. Her illustrations are colorful, graphic, vivid and filled with pure love. On her Instagram account @drawnbyjovanna, she works to strengthen the sisterhood. She wants everyone to feel safe and courageous and therefore wishes for a future without racism, sexism and prejudices. In this shop she offers prints of her art, tote bags and custom made paintings just for you.